Interesting: Google replayed to Steve Jobs! As I as said above, I also faced Gmail Constantly Redirecting problem in my Gmail account. When I login to one of my Gmail account, within few seconds it automatically starts redirecting to Calendar. I don’t know how this is happening in my Gmail account. Because of this issue I’m not able to read any of the emails which is available in my Gmail Inbox. After researching a bit I noticed that Gmail redirecting problem is happening in only Firefox Browser and not in other browser. So tried to login to my Gmail account with other browser such as Google Chrome and Internet Explorer browser and it works fine without redirecting to anywhere else. This confirmed that Gmail Redirecting is happening only in Firefox browser. How I Fixed Gmail Redirecting Problem? In my case I just formatted my PC because I think that some Virus are working on my Pc. After formatting my pc, when I login to my Gmail account it won’t redirect to calendar or somewhere else. It’s works fine after doing this. But this is not the fix for you. I noticed that, many users suffering from Gmail Redirecting issue with only Firefox browser. So better to check the Add-ons you have recently installed or try uninstalling one by one add-on in Firefox browser. In most case some add-on may give this type of trouble Or if possible try to Reinstall the Firefox browser. How other People are fixing Gmail Redirecting Problem? Check your system date whether your system date is correct to the actual date,month and year. Check it properly because most of them having a problem because of Date only! Delete Cookies and Files in your browser by closing your browser. After deleting Cookies and Files in your browser, open your browser and try to login to your Gmail account. Don’t check the “remember me on this computer” option when you login to your Gmail account. These are the few thing how other people solved their Gmail Redirection problem. Most of them fixed their problem by correcting the System date in there computer. 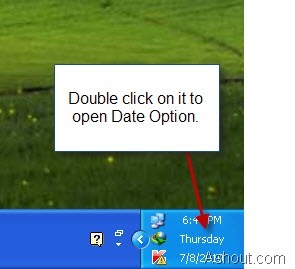 look at the right side of the task bar and Double click on Time after that you will get Date and Time Property, just update it to current date. just disabled it, not even removed and the redirecting to Google Calendar just stopped. THANK YOU SO MUCH for the helpful suggestions here! I thought I was going nuts! LOL! I deleted my cookies and disabled integrated gmail in my addons and the problem is resolved. I can read my e-mail now without it always jumping to my calendar. I Disable the “Integrated Gmail”, yes, it works! It was the Integrated Gmail, thanx a lot! Yes, Thank You!…This started to piss me off lol, but disabling integrated gmail fixed it. Just wanted to confirm integrated gmail addon 2.5.5 that messed my stuff as well. thanks for the post. Also AutocompletePro cannot be deleted from addons window. I needed to go to the control panel uninstall screen. that plugin was also causing issues for me.